When Patrick Gookin moved to Los Angeles in 2010 to work as a photo editor, he faced an hour-long commute from Koreatown where he lived, to the beach neighborhood where he worked. In an effort to avoid freeway traffic and deepen his experience of LA, he began driving through city streets. As he explored this uncharted landscape he took quick iPhone photos of strangers along the way, drawn to the secrecy that shooting from his car provided, and how that seemed to clash with their presence in open, public spaces. 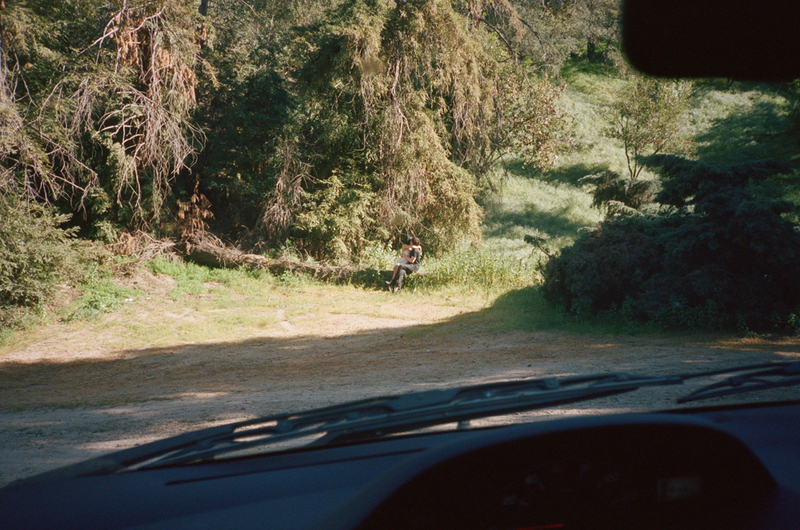 After making and sharing these images repeatedly on Instagram for a year, Gookin started to stage the photos, working with actors and a point and shoot 35mm camera, evolving the photographs into his series LA By Car. Despite using actors, the images feel all but contrived, more closely resembling Google’s street-view photographs than the large scale color narratives of Jeff Wall, Gregory Crewdson or Phillip Lorca. While the framing and gestures are carefully constructed, Gookin’s pictures have a natural jaggedness that, even in a ‘post digital’ era where truth is rarely accepted, appears natural and spontaneous. Gookin’s use of a point and shoot camera and consumer grade film help give it this raw, low-fi resonance. Gookin also cites Google’s mobile camera and what he sees as its relationship to photographic history as an influence to his work. “I thought of these photos as the place where the Google car meets Lee Friedlander's America By Car in a strange Los Angeles that I was able to bend past normal reality." Aside from aiding his creation of spectacle, the decision to use actors was largely a riff on the common cliché that aspiring, and often-failed actors overpopulate LA. “In some cases,” says Gookin, “the actors were placed specifically in scenes to create a feeling of isolation that I was looking for and in other images scenes from art photographs are reenacted in new contexts.” For Gookin, the identities of these actors are less important. Instead he uses their obscured likeness to emphasize the perceived coldness of LA’s social landscape. Bio: Patrick Gookin is a 31 year old photographer from Salem, NH currently living and working in Los Angeles, CA. He achieved his BA in New Media from Emerson College in Boston in 2006 and has spent the eight years since split between Los Angeles and Tokyo. He recently published a book of this work, which you can (and should) purchase here.